I am reluctant to write about le Chateaubriand, arguably the best -- and almost certainly the most exciting -- bistro in Paris, because it is so difficult to get into it. But if you are lucky enough to know someone who knows the rock star chef, Inaki Aizpitartes (as I am) or if you are willing to go to the late, non-reserved seating, which starts in principle at 9:30 (although you are not likely to be seated before 10), then by all means go. You will be rewarded with an extraordinary experience. Physically, le Chateaubriand is a thoroughly unprepossessing old-style bistro, with tiny tables, neither tablecloths nor placemats, a banal couvert (you keep your implements for most of the meal), no flowers, etc. The food is the opposite: brilliantly creative, well-presented and perfectly executed. Every day there is a 55-euro menu, which is created based on the market and the inspiration (mood?) of Chef Aizpitartes. Period. No choices, no substitutions (except in case of allergies). One member of our party said he didn’t like offal, a couple of morsels of which were included in the lamb mélange; too bad (he ate them without incident). 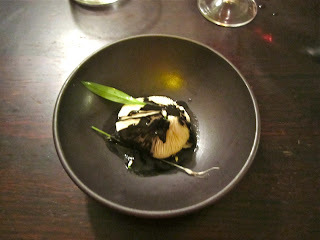 Las night, the meal began with four substantial amuses-bouche, including amazing fried baby shrimps with tamarind powder and cumin, served with mysterious flower blossoms, a morsel of perfectly cooked duck breast in broth, and a gorgeous finely sliced mushroom served over squid ink (pictured above). 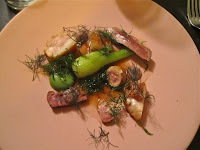 There followed lightly cooked and unspeakably delicate bonito with red onions; rouget with white asparagus and elder flowers; and lamb many ways (filet, belly, sweetbread, kidney and more) with fennel. 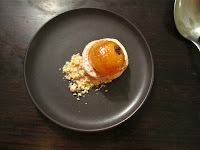 Then a choice of desserts – rice flavored ice cream with a prune and a (fried? roasted?) 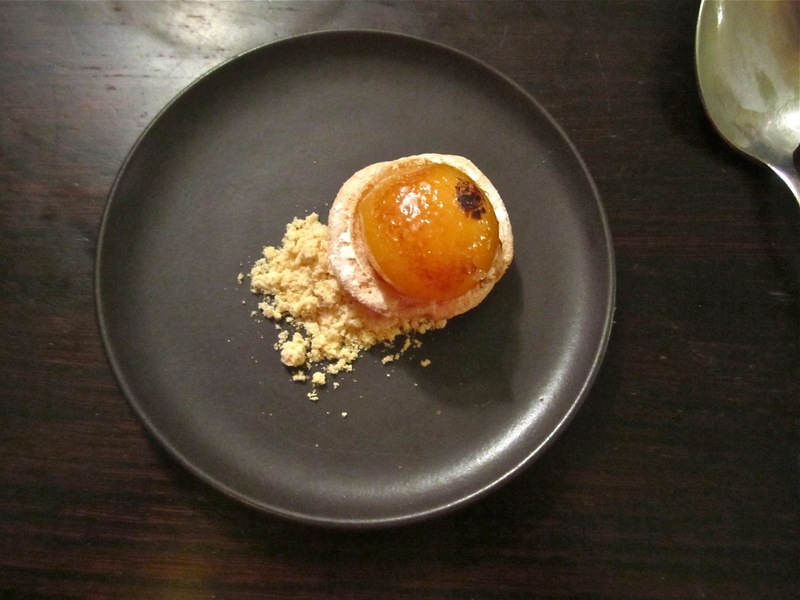 then bruléed egg yolk served on a pastry with ground camomile) -- or cheese. We all opted for the desserts in order to sample yet more of the chef’s genius. Not the best part of the meal, but high marks for creativity. Anyway, you get the picture. It's not for nothing that le Chateaubriand is rated 15th by The World's 50 Best Restaurants, second after l'Atelier de Joel Robuchon among French restaurants. Although the list is silly, the esteem in which this neo-bistro is held is not. Le Chateaubriand, 129 avenue Parmentier, 75011 Paris (Métro Goncourt).